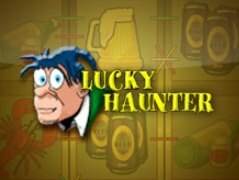 Lucky Haunter slot from the Igrosoft Company is another enjoyable inclusion into the slot game world. Despite being another simple slot game, it is different in terms of its refreshing theme and attractive graphics. It is thoroughly enjoyable, and you are bound to get glued to it once you begin. What works in favor of this game is the ease with which players can understand the rules and scoring; this ensures that almost anyone can play the game. To add to it, you have a lot of attractive bonuses and also opportunities to earn some big money. There is a Frankenstein-like figure sitting in a chair below the five reels and at the bottom of the slot machine are various buttons for playing the game. The symbols that appear are based on different types of seafood and alcoholic beverages. There are a maximum of 9 lines on which a player can place bets; so you are better off placing bets on all of them to enhance your winning hopes. You can play for as many as 225 credits that are equivalent to 25 credits per line. The stakes are high in this game, and you should go for all when you play. Among the different symbols that will come up on your screen, the wild symbol in this game is a ‘horseshoe'. This symbol can replace many other symbols in the game apart from a chosen few. There are quite a few bonuses waiting for you if you can match 3 or more of any of the symbols. There is also a bonus game if you can match 3 or more cork images. The player has five corks on the screen, and there are hidden bonuses under each cork. If all corks have bonuses, you get the chance to play the super bonus game. Two plates show on the screen, one of which has fried chicken leading you to victory and a huge gain. Another addition to the excitement of the Lucky Haunter slot is the risk game that you can play. It gives you a chance to double up your winnings. In the game, you must choose from among one of the 4 shadowed cans. If your card is of higher value than that of the dealer, then you win and get double of what you already have. Having the same value will not harm your previous winnings but you won't get anything extra. Indulge yourself in this incredible game and enjoy success.